March 2, 2017 (Springdale, Ark.) – Creative Soul Records recording artist, worship leader and cancer survivor Melinda McGlasson is scheduled to appear as a guest on this weekend’s edition of “Hour of Power,” the popular televised worship service with Pastor Bobby Schuller. McGlasson, who was at the church for three services on February 11, shared her music and her message of hope regarding her cancer struggle. “Hour of Power” airs on TBN on Saturday at 6:30 p.m. PST/9:30 p.m. EST. The show also will be broadcast via the “Hour of Power” website on Sunday. McGlasson currently is promoting her single, “Trust Him,” which hit No. 1 on Christian Radio Chart Weekly. The song is playing at Christian INSPO/Soft AC and Christian AC radio. “Hour of Power” began televising in 1970 from the Garden Grove Community Church on the advice of the Rev. Billy Graham to Bobby Schuller’s grandfather, the Rev. Robert H. Schuller. The ministry, which is based in Garden Grove, California, has grown throughout five decades to garner of audience of millions of people around the world weekly. For complete TV listings for “Hour of Power,” visit the ministry’s website. 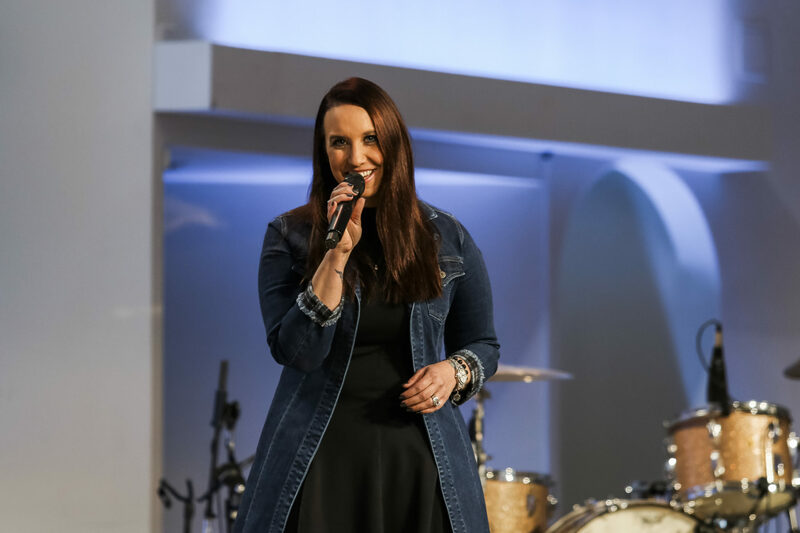 McGlasson, who is a worship leader alongside her pastor husband, Dallas McGlasson, at Lifeway Christian Center in Guymon, Oklahoma, has been on a personal roller coaster for the past couple of years. In August 2015, the mother of three was diagnosed with ovarian cancer. After receiving prayers for healing from all over the world, McGlasson underwent surgery to remove what was revealed to be a non-malignant mass. In the midst of cancer treatment, McGlasson signed a record deal with Creative Soul Records, confirmation, the singer/songwriter said, that she should continue along her musical journey. In May 2017, McGlasson received a call from an agency that connects adoptees and biological families to discover health histories. McGlasson, who was adopted as an infant, took the call, expecting the agency to ask her to perform at an event, given her background. Instead, the agency was calling to tell McGlasson that her birth mother had thyroid cancer and was trying to contact her to alert her to news of her biological family’s health history, a fact the singer, ironically, had already discovered.